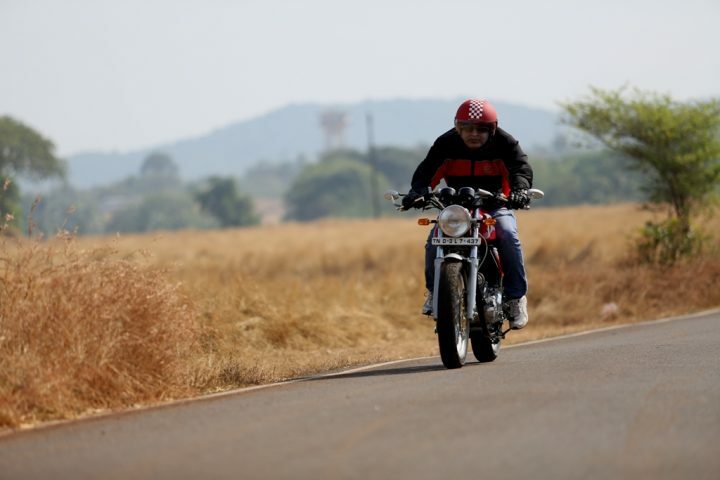 We test drove the Royal Enfield Continental GT Cafe Racer Motorycles for over 200 Km in Goa during the official media ride in November 2013. 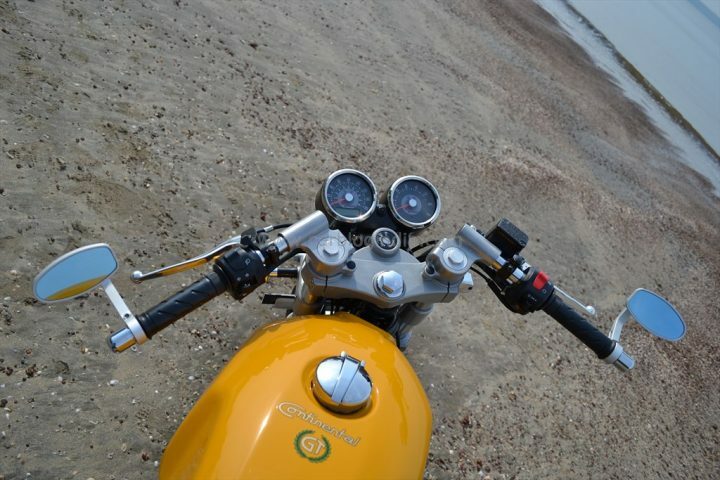 In the following write-up we give you our detailed review from our experience of Royal Enfield Continental GT Test Ride review with a detailed video review and walk around with important features, specifications, paint options and on-road price of the RE Continental GT in India. 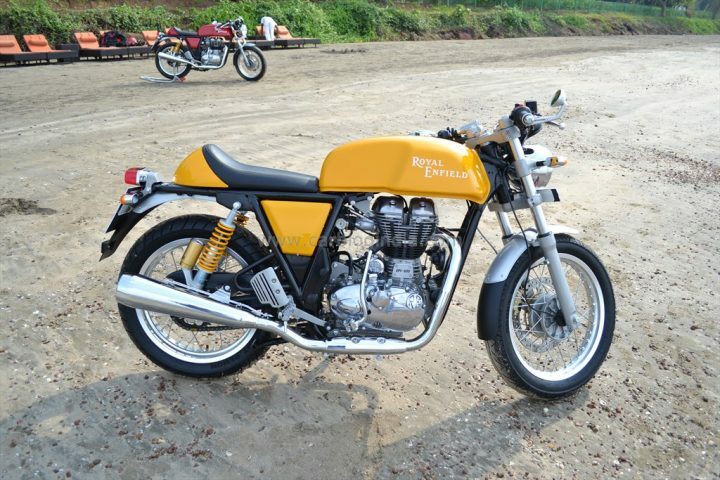 The Royal Enfield Continental GT is priced at Rs. 2.05 lakhs on-road in Delhi and Rs. 2.14 lakhs on-road in Mumbai. The Royal Enfield Continental GT Cafe racer takes you back to 1960s and 70s when the Cafe Racer culture developed in UK and other countries. The styling is completely retro with swept back fuel tank, long seat, clip-on handle bars with handle bar mounted rear view mirrors, instrument cluster with a large tachometer and speedometer finished in clean rounded casing, chrome finished fuel tank lid, headlamp mounts, handle bar and engine casing. Bits like the gold-painted front and rear disc callipers, yellow rear mounted gas filled shock absorbers, a simple tail lamp cluster with touches of chrome also add to the unique retro look of the bike. The mud guards have been finished in metal as well as plastic in parts gives it classy yet modern look. The foot pegs are finished in matt aluminium like finish and have guard mesh behind it. With the largest capacity Royal Enfield engine in India, 535 CC to be precise, the Continental GT produces a peak power of 29.1 BHP along with peak torque of 44 Nm. It uses a unit construction engine which is fuel injected with digital ignition control. The low end torque is not very notable, which makes you rev the engine harder than usual to get it rolling from a standstill. Once the motorcycle is in motion, you can easily cruise at speeds of 60 to 80 KMPH in top gear at around 2000 to 2500 RPM with engine being fairly relaxed. But if you want to get some power out of the engine, you need to rev past 2000 RPM, the mid end power delivery is really impressive until 4000 RPM after which it tends to fade and the vibrations increase as this engine is not designed to rev too hard. There are notable vibrations which start around 3000 RPM and interestingly, you don’t feel any of these in the chassis or the foot-pegs, but most of the vibrations reach the handle bar which can be tiring on a long commute. The chassis of the Continental GT is one of the stiffest in the RE family which is evident from its sharp handling. The suspension has been well tuned to gobble up road bumps and feels more or less like the cruisers in RE’s range but unlike them you do not hesitate to chuck this bike into a corner or execute a rapid direction change. 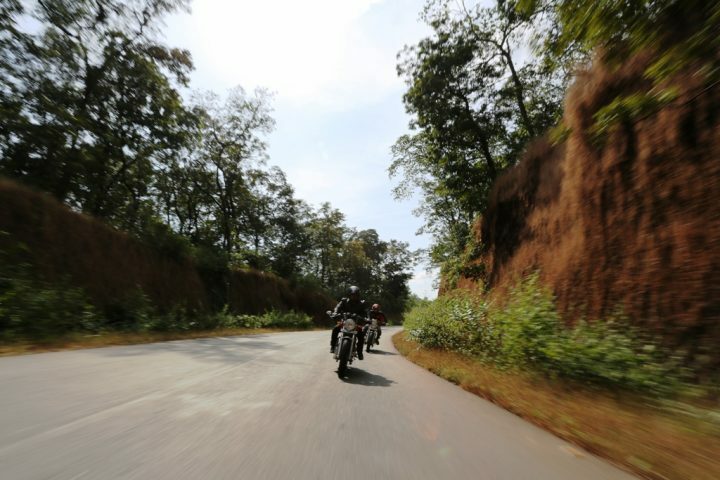 We felt confident riding on twisty roads at speeds close to 70 KMPH. However, the weight distribution of the bike could have been better as the bike is very tail-happy during hard braking. The performance of the brakes on Royal Enfield Continental GT is good with large 300 mm disk at front with dual piston callipers and rear brake with a 240 mm disk with single piston calliper. The large turning radius of the bike can be troublesome for some riders while making slow and sharp turns. The weight of the motorcycle, about 184 Kg, hinders slow maneuvering too. 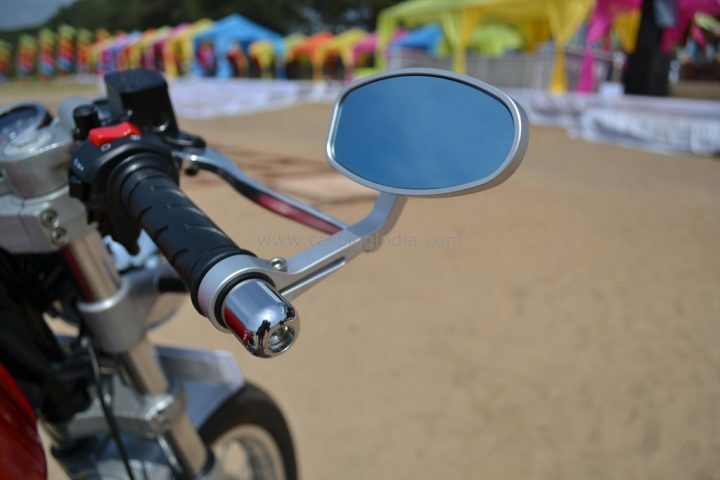 Royal Enfield has used high quality of materials for the switch-gear and instrument cluster while maintaining a subtle and retro styling. The large tacho meter on the right and speedo on the left side of the instrument cluster are finished in chrome and round in shape. To add to modern functionality, it contains a small digital display with fuel gauge, odometer and tripmeter. The quality of switches is good and choke lever is provided on the hands bars itself on the left side. There is also flasher (dipper) button for convenience. There is electric start switch on the right hand side with headlamp control. The gadgetry has been kept to minimum to keep the simplicity and spirit of cafe racers alive. 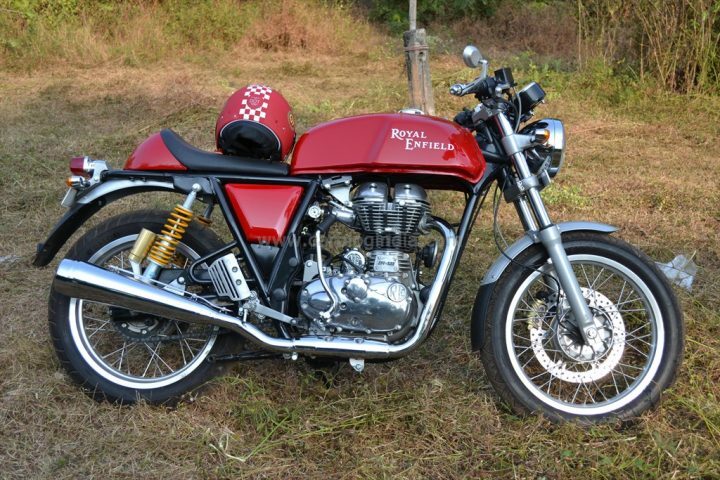 Conclusion- Should I Buy Royal Enfield Continental GT? First of all, Royal Enfield Continental GT cannot be compared to other motorcycles in this price category because it is a Cafe Racer and not a sports motorcycle. It lives up to the spirit of Cafe racer in its styling and does thrill the rider with the kind of uniqueness it has on offer, it is not supposed to be driven hard. 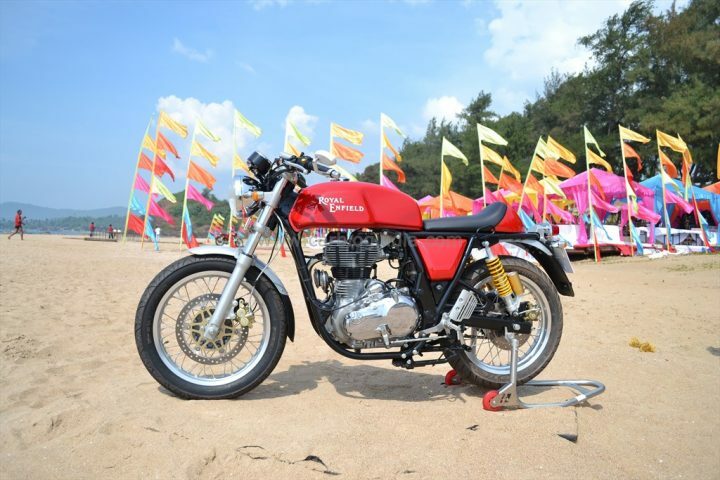 The engine has a distinct Royal Enfield DNA with a different take on the classic thump and a very peppy nature, the handling and braking along with its quality makes it a desirable motorcycle. At the same time, it is not meant to be a commuter for long rides, it is meant to be a machine for the passionate riders who want to experience something distinct. 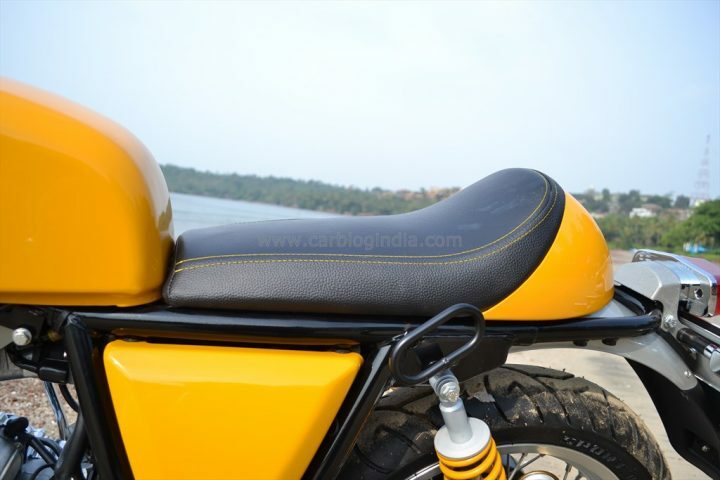 The Royal Enfield Continental GT has been launched in two colour options, Red and Yellow. Both look very attractive and the paint job is very high in quality. Along with the bike, Royal Enfield has also launched a host of apparels like shoes, helmets, riding gear including jackets, gloves etc. We hope you like our review, if you do, please share it with your friends on Facebook and Twitter. Test Ride review video of the Royal Enfield Continental GT will be up soon, so stay tuned and bookmark this page.